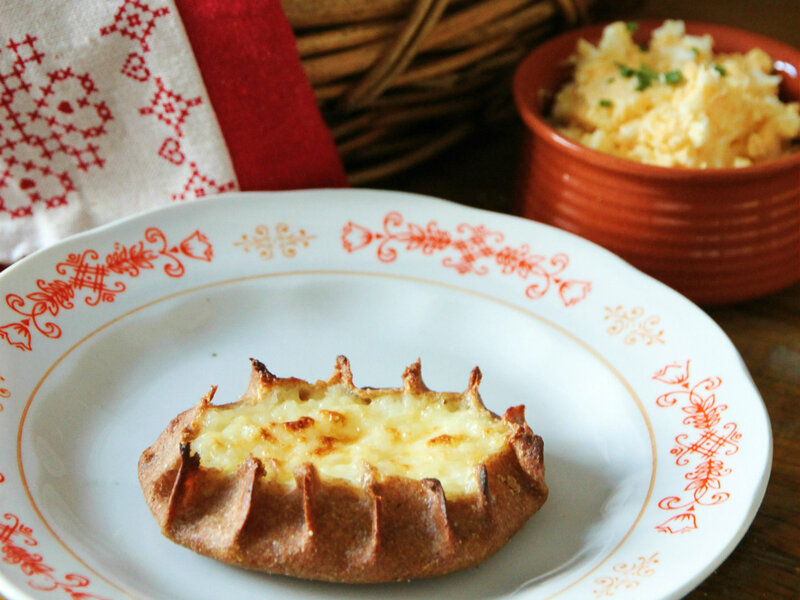 Karelian pasties have a reputation of being notoriously difficult to make. Fear not though as that is not the case! Somewhat time-consuming this labour of love is though, what with the porridge-making and crimping. Apparently every pasty-maker has their own signature when it comes to this. Originally these pasties were stuffed with barley porridge which was cheaper at the time, but since then rice has become the most popular choice. Some make the pasties with mashed potatoes and some with carrots. In certain parts of Finland the tradition is to stuff the pasties with berries! Bring water to boil. Add butter and rice. Continue cooking until water has absorbed and then add the milk. Let simmer until porridge is done, about 35-40 minutes. Don't forget to stir, otherwise the porridge will burn at the bottom. Season and let cool. Once cooled, whisk in the egg. Knead to a smooth, pliable dough. Divide the dough into four portions and roll each portion to a stick. Keep the rest of the dough covered as you are working on each portion. Divide the stick of dough to 4-5 pieces and roll on a floured surface to a thin disc. The crust is supposed to be thin as this is what makes it crisp, but go fairly easy on the flour - the thinner and drier the dough, the more likely the crust is to tear at the crimping stage. A useful tip for a beginner is to roll the dough into a thin sheet and then, using either a cookie cutter or a small bowl (about 12 cm in diameter) cut the sheet to equal size round discs. For this, a pasta machine might just be a useful tool! Spoon the porridge on the discs (about 2 tbsp per pasty), fold the edges on top of it and crimp. This should be done with fairly light fingers as the pleats should not be too sharp - the more they stick out, the more likely they are to burn in the oven. These need a hot oven, depending on the oven 250-275°C (482-527°F). Place the pasties on a baking tray (no parchment needed as it would only burn). Since there's no yeast or baking powder in the dough, these won't expand during baking so there's no need to leave space between them. Once the pasties get a bit of colour, remove from the oven and brush with melted butter. Let cool while covered. Boil the eggs and cool in ice water. While still a bit warm, mash with butter using a fork. Season with salt and chives and serve with the pasties. Erja Säkkinen is Finnish, one quarter Karelian. Her blog, Under the Andalusian Sun, first saw the light of day in Andalusia. Since then the cooking ventures have branched out from tapas treats to other Mediterranean cuisines as well, recreating food memories from her travels in the Middle East and even flirting with Asian food.